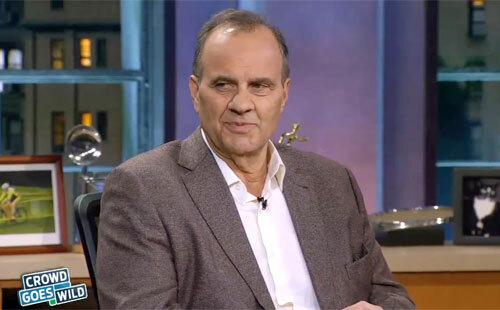 WEST HARTFORD, CT. — Former MLB manager, Joe Torre, is one of five recipients who will be honored by the University of Hartford at its commencement weekend ceremonies on Saturday & Sunday, May 17 and 18, 2014. Each will be awarded honorary degrees for their contributions to society. Torre will speak on May 18. Photo shows Joe Torre, speaking to Regis Philbin about his Hall of Fame induction phone call. Torre is the former manager of the New York Yankees, St. Louis Cardinals & Los Angeles Dodgers. Torre led the Yankees to the playoffs every year under his management. He is currently Major League Baseball’s Executive Vice President for Baseball Operations. As a player, Torre also earned nine All-Star selections, capturing the 1971 National League MVP award while playing for the St. Louis Cardinals. Torre will be inducted into the Baseball Hall of Fame on July 27, 2014 along with fellow managers Bobby Cox and Tony La Russa. Sports Speakers 360 is a booking agent for motivational sports speakers. If you would like to book athletes like Joe Torre for a speaking engagement, autograph signing, guest appearance, product endorsement or corporate event, contact Joe Torre’s booking agent for appearance and speaker fees or call 1.855.303.5450.